...the reason I am sharing with you all this is to be careful while walking or jogging on side walk or trails as its winter season and sometimes there is fog we don’t know where we are heading to...and when we come to know its too late so my dear friends be very careful as to who is following you or behind you! The guy looking at her ran from the scene..The lady in the neighbourhood picked my cousin who was kinda unconscious ...and took her home ..she called the cops immediately and then my cousin was taken home by them ..who still could not get over the shock as to why it happened and who was that guy? I would highly recommend Gyms in winter as its safe and facility provides everything ...so be safe and be healthy and always look around .. "never be lost in your own world"
Thanks to the lady who came forward to help .. such incidents are quite traumatic.. Indeed a blessing for her ..but this has scared her a lot she cannot get over the trauma! Your warning and recommendation should be given heed by all concerned. Thanks for your recommendation Harman. Caution is what needs to be exercised and never things to be taken for granted even in safest places! Its really sad to hear and very traumatic. That's pretty scary. We really need to be careful and watchful. God be thanked. She had been very lucky. A boy may get robbed but a girl has much more to lose. 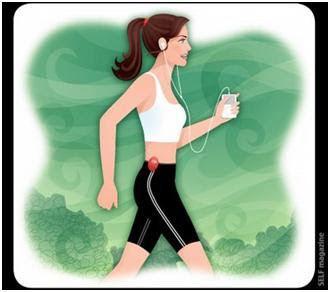 I agree with you that one needs to keep a sharp lookout without any distractions while not only jogging but at times going for some urgent errand too in such weather conditions. Hope she has come out of shock. Please say my best wishes to her. OH MY. I dont beleive this. Is ur cousin ok. I think such petty thefts have become very common now , the quick buck to make , steal the fone and sell it off.. Scary thought I hope she recovers fine ..
and Thank you to the lady across the street ..
@ bick..she is ok..kind of little scared with time she will come out of that phobia..we are all scared and decided to be careful Cuz this was something which has shaken everybody at home! @rakesh ...thanks ...I am glad you visited my blog! visitin any place try to be safe ..and look around! @urmi..yep it is a trauma for any girl to be harassed like that! yes true...and ladies plz make sure you r wid some one while walking or joggin ! very true ..very good opinion..specially when we need to have some urgency we jus dont look whether its day or night how safe it is outside...we need to be more careful! गणतंत्र दिवस की आपको हार्दिक शुभकामनाएँ. @ a,,I dunno wht you wanted to say..you left you comment in-between! Thanks to the lady but it will be a long time before she recovers from the shock of it. This time the lady helped but no one knows about the next time. I will be scared to go out.